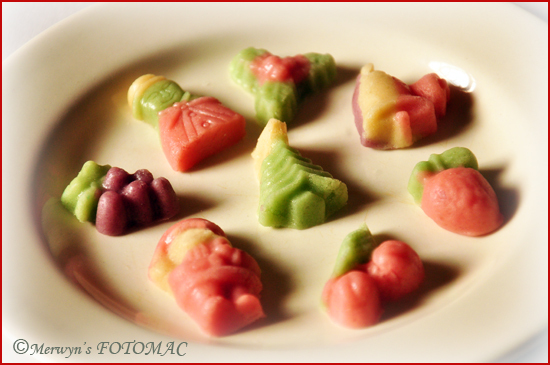 Marzipan is a favorite & popular Goan sweet made especially for Christmas. It can be moulded easily into all sort of shapes using rubber or plastic moulds which are easily available in the stores. You may even use your artistic talent & utilize your creativity to shape them into fruits & paint on them using edible colors & a paint brush. Let the shapes rest for 3 to 4 hours before painting as the surface needs to seal well so that the color does not seep through. After painting it needs to dry well so that the colors do not run. Use light feathery strokes to paint on the shaped fruit. Grind cashewnuts to a fine powder & soak with rose water for about 15 mins. Grind cashewnuts to a fine paste. Lightly whisk the egg whites. In a thick bottomed pan, combine cashewnut paste, sugar, whisked egg whites; mix well. (I used a pressure cooker without the lid). Place the pan on a low fire; keep stirring continuously. Make sure that the mix does not stick to the bottom of the pan & does not burn. Cook till mixture thickens & starts leaving the sides of the pan. Pour out the mixture in a plate & muscle with a spoon/spatula till the mixture cools down. When cool, muscle again using some rose water sparingly. Knead till it forms a pliable smooth & soft dough. Keep aside to rest for awhile. You should be able to mould it easily. Divide into balls if using color. (I divided it into four parts). Use a rubber or plastic moulds to shape them. You may even shape them into fruits if you like. Place the moulded pieces on a tray. Let it dry & then store in an airtight container. Serve & enjoy at Christmas. Select cashew nuts which will not release oil. You may use blanched almonds instead of cashew nuts if you like. Many prepare the marzipan dough without cooking the mixture but I prefer cooked mixture. Use color sparingly. Keep colors pale. To add color use a dropper or a tooth pick. Put the desired color on a plate or saucer. Use your finger to lightly dip in the color. Spread on the dough ball & knead till the color is well incorporated in the dough. Remember pale colors makes marzipan look pretty! Use basic edible colors to make other colors in case you need to.. I must say I totally love your cooking, I can understand all your dishes so well 🙂 , i've been cooking since 10 yrs, and its a pleasure to follow someone so experienced ….your blog is totally my kinda cooking.I can feel how passionate you are about food b'coz i am too .I tried your Mint Chicken curry, its was deliccious .Ive made marble cake before , but you technique for Zebra torte was awesome . 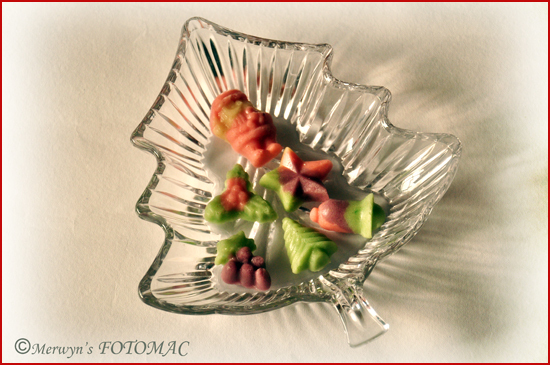 I'm going to start the Christmas sweets , this time will try your variations. thanks so much for the lovely recipe ma'am…. id like to know for how long should i keep the marzipan to set after i'v cooked it? Thank you for your feedback. I'm really glad it turned out so well for you. Hi Elsa… After moulding the marzipan, you should allow it to set for an hour or two… To test, hold a piece & it should not be sticky but dry & a little soft. Tried this recipe today to make easter eggs. Followed it exactly just added 2tsp of almond essence. Turned out awesome. Perfect recipe. Thanks for sharing it Hilda. Hi Hilda thanks for sharing such lovely recipe going to try this year for Easter eggs only wanted to know how to select cashews which release less oil.